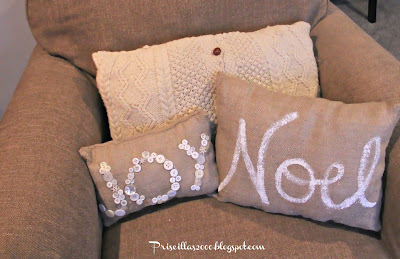 I love all the Pottery Barn Christmas Pillows ! I have seen a lot of bloggers making them , so my daughter and I decided to make our own version..We made the sweater pillows from Good Will sweaters. Sewed with the sewing machine then stuffed or put an old pillow inside. 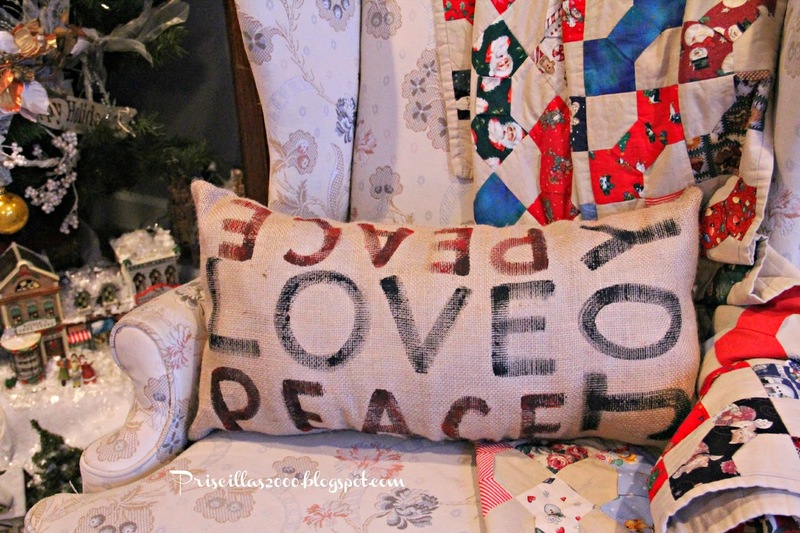 Below are pottery barns pillows.. I didn't want to use the same kind of font , so we just went with a simple font , freehanded..with a few swirlies.. We used burlap ..1 yard made 2 of the jingle pillows and 2 of the Joy button pillows. The burlap cost $2.99 at Joann Fabrics. Not bad for 4 Christmas pillows ! I got the red jingle bells at Dollar tree. We just stuffed the pillows with fiber fill. and sewed by hand the pillows to close the openings on the bottom. For the big sweater pillow I cut it off under the armholes and sewed it with my sewing machine. I stuffed it and sewed the bottom by hand. I think its a handknit sweater and it makes a beautiful pillow. 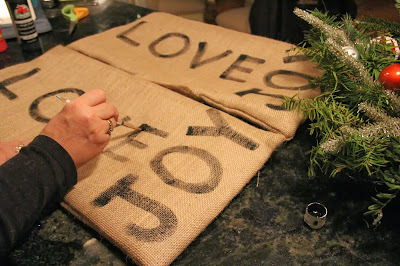 For the little JOY pillow , I painted the word JOY with white craft paint, then we hot glued buttons to the top of the word.. 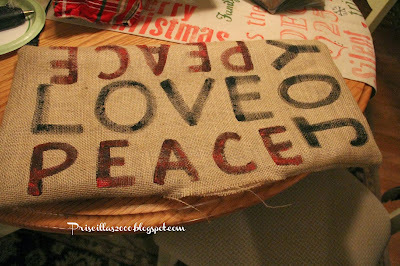 The NOel pillow is Painted then glittered, on burlap. 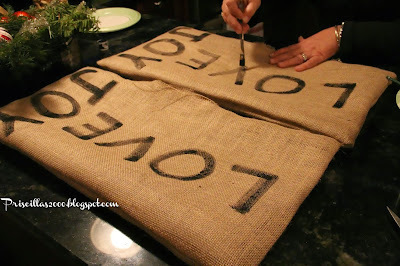 The pottery Barn version ..
We didn't use stencils ...I just freehanded them..We put parchment paper inside the burlap before we painted them so it wouldn't bleed through to the back. 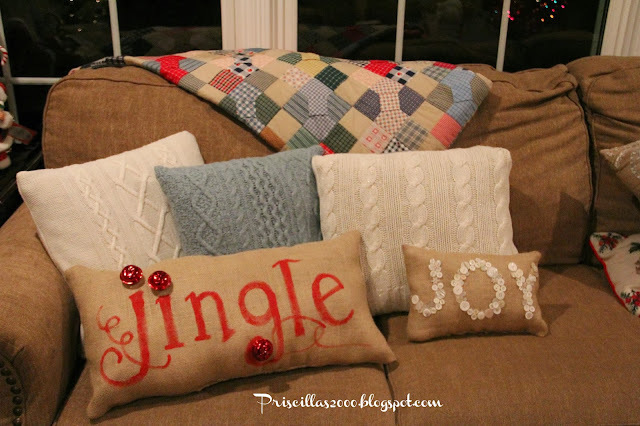 They aren't as big as the pottery barn version , we made them the same size as the Jingle pillows.. I think they look great for so little money ..
Oh my gosh, I love those pillows! 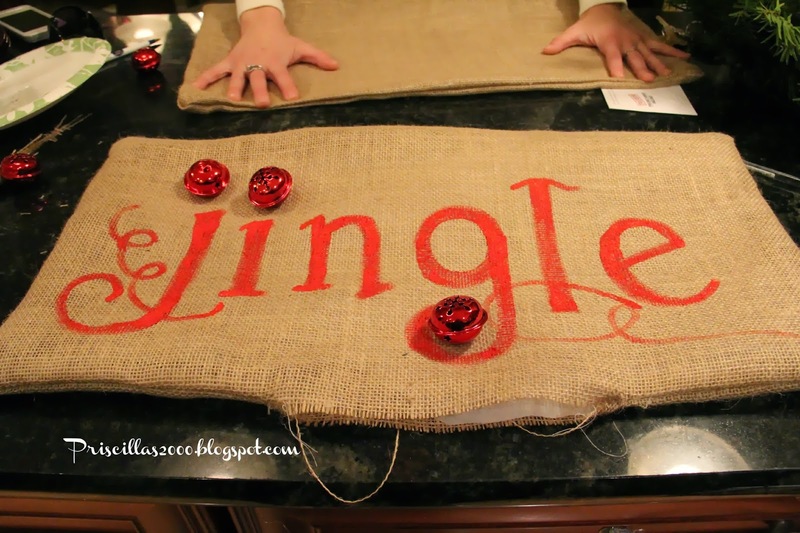 The "jingle" one would be so perfect in our house as I have a child who is so suddenly enthralled with the jingle bells that we have nicknamed her "Jingles" for the holiday season! I will have to start looking for sweaters at the Good Will now, too! They look like Pottery Barn..they are fabulous…you and your daughter did a great job…I so love them!!! Your cushions are brilliant!! You must have a very steady hand to be able to paint so neatly!! !Such a lovely idea and seems so simple but so effective. You are so clever and so creative.. I had to go thru your list of the Christmas trees in your house to make sure I hadn't missed any in your previous posts - wonderful. They are beautiful on-line, but I can only imagine how truly incredible it must be in person! Your talent seem limitless and amazing. It makes you wonder how they can charge so much when you can do the same for a fraction! They look wonderful! I saw you linking up at the Christmas Extravaganza Party. Lovely pillows. I have lots of white antique buttons, you have given me ideas!